Unroll Pillsbury™ Crescent Recipe Creations™ refrigerated seamless dough sheet onto a cutting board that has been lightly dusted with flour. Cut using leaf shaped cookie cutters. Set your crescent roll leaves on a baking sheet lined with parchment paper. Set your scraps of crescent roll dough on another baking sheet, if desired. Brush butter over each leaf shaped crescent roll. 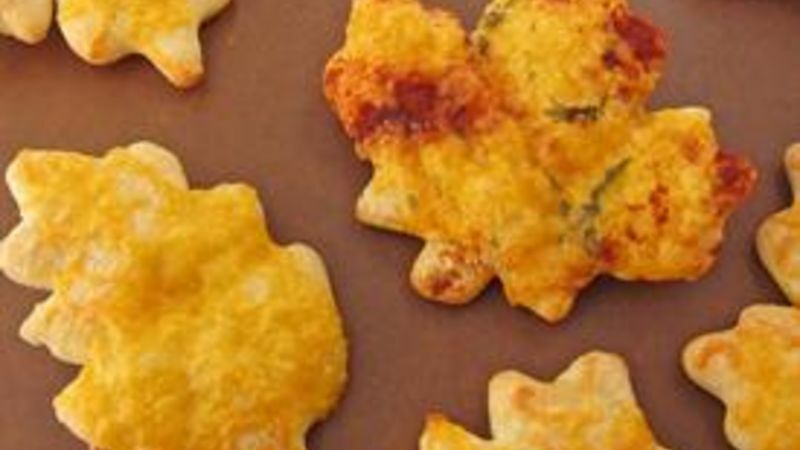 Sprinkle cheddar cheese over each leaf. Optional - If you want, sprinkle on some paprika and/or parsley to add some color to your leaves. Bake for 7-8 minutes until the rolls are golden brown and the cheese is bubbly. Bake your tray of scraps for 6-8 minutes until golden brown. Snack on them while you are working. Once out of the oven, you can serve immediately, or allow them to cool, store them in an airtight container and re-heat just before serving. Place in a warm oven and heat for 3-5 minutes, just until warm.